If you haven’t been keeping up with the in-ear headphone scene these last 12 months, you’ve missed an awful lot - including our favorite new earphones, the 1MORE Triple Driver: for $99 (£85, AU$179), they offer about the best sound you’re going to get from a pair of earbuds due, in no small part, to the triple driver array packed inside each earbud. But, as it turns out, 1MORE isn’t the only company with a compelling triple-driver headphone on the market. 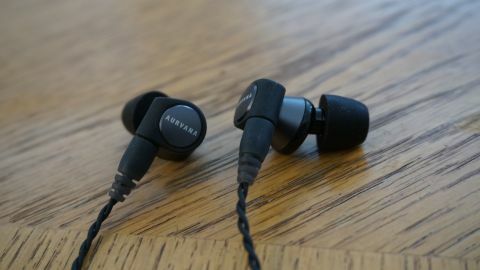 Creative has just announced a pair of its own called the Aurvana Trio, part of its premium line of Hi-Res audio products and, despite being a bit pricier than 1MORE’s earbuds, they give the Triple Drivers a fight for their lives. So which one should you buy? Well, after weeks of comparing the two triple-drivers side-by-side, ultimately, we have concluded that you can’t go wrong with either of these exceptionally balanced, immaculately crisp in-ears. Before we dive too deep into the sound quality of Creative’ Hi-Res headphones, it’s worth going over what exactly triple-driver headphones are and why they’re so much better than the single driver headphones you’re used to hearing. In simplest terms, the words ‘triple-driver’ refer to the triple driver array inside each earbud. Why three drivers instead of one? Two precision balanced armature drivers deliver clear mids and highs, while one bio-cellulose driver exclusively replicates accurate and powerful bass - i.e. instead of one driver that’s forced to produce all areas of sound simultaneously, triple driver headphones divide and conquer the audio spectrum, often with spectacular results. More to the point, these headphones have a measured frequency response of 5 to 40,000Hz, or about double what the human ear is capable of hearing. While the sound quality is substantially better with triple driver headphones, the trade-off here is that they might be a bit larger than the earbuds you’re used to wearing. Because they’re a bit larger and protrude from the ear a bit more than you’re used to, they’re not exactly what we’d consider low-profile or necessarily the kind you’d want to use while laying bed. That said, to aid in making them as comfortable as possible, Creative at least packs four pairs of replacement tips in every box, including one pair of foam eartips that better conform to the shape of your inner ear and help seal out noise. Connecting the earbuds to the right-angle 3.5mm jack is a braided cable that drastically reduces cable noise and, as an added bonus, is completely replaceable once it begins to fray. On it, you’ll also find a universal inline remote with a built-in mic and controls for pause/play. It’s a bit plastic-y in our opinion, but thanks to a replaceable cord, that’s something that could change easily in the next iteration of the headphones. While the design of the headphone enables the possibility of better audio quality, it would all be for naught had the headphones actually sounded less than perfect. Thankfully, they sound just as good if not better than the design promises. We could wax poetic about the clarity and sound reproduction that smoothes out even the lowest-resolution music in your collection, but the proof is in the pudding as they say. A 5 to 40,000Hz frequency response should help cover the highs, lows and everything in between, and supremely light design keeps them in your ears for hours without fatigue. That last part is key here: While we’ve heard great-sounding in-ears in the past, they’ve usually been too bulky to wear for long periods. While there are some minor compromises to be made here - we couldn’t get a 100% noise-cancelling seal with our pair of earbuds - the Trios are supremely comfortable. They’re the kind of buds you can bring with you on the subway, around town or just wear them lounging at home, and they’ll sound great in nearly every scenario. If you have the money for some truly spectacular in-ears, the Creative Aurvana Trio are well worth their updated $149 (about £100, AU$200) sticker price. They’re darn comfortable, sound great and offer extreme clarity in nearly all areas of the audio spectrum. If $149 feels a bit too far out of your price range at the moment but the idea of a triple driver headphone sounds appealing, don’t miss the still-phenomenal $99 1MORE Triple Driver Headphones.